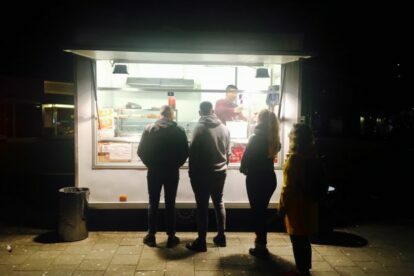 The food stall of Miss Saigon is well known in Rotterdam as the place to go for a midnight snack (mainly spring rolls and pasties). It is situated just off the busy Hofplein roundabout, and is open when it needs to be (weekend nights till late, not sure about the exact times). All my friends have been there thousands of times in their younger years, my boyfriend even admitted that he used to have the private number of the guy working in the stall, so he could place large orders while he was going out, to be picked up after: spring roll afterparty! My youth years were spent in Amsterdam, so I had some catching up to do. I had seen the stall plenty of times, but it was never the right time until recently. After a night of drinking, a friend and I were walking home, hungry of course, when Miss Saigon appeared. We decided to have a spring roll each, and then another one! Of course midnight snacks always taste extra good, but these tasted fresh, really tasty, and nice and hot. Simply a good spot for a nice snack before you go to bed, or to get some energy and continue the party!